This is the perfect map for survival in Minecraft Pocket Edition! Here you will find a small village, surrounded by a fence from attacking monsters. Lanterns are installed on the whole territory of the village, which illuminate the houses at night and off during the day. Also you will be able to meet the golems, which act as guards. This increases your security and you should not be afraid of any monsters! Mo' Golems mod for Minecraft PE 0.11.0 / 0.11.1You get the ability to create incredibly powerful creatures that will protect you against all enemies! 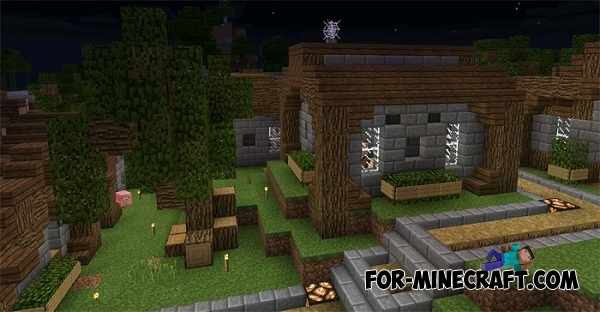 Golems PE v3 mod for Minecraft PE 0.11.1 / 0.11.0This mod adds 12 different golems in Minecraft PE. If zombies, skeletons and other creatures attack you, then golems will protect you by killing enemies.